Have you ever started playing a game that you don’t know much about but all your friends keep telling you to play? So you just do without actually looking up what it’s about? That’s what happened to me with Night in the Woods. And that’s also why I ended up crying my eyes out over a really well developed, well written, relatively short and incredibly deep video game. 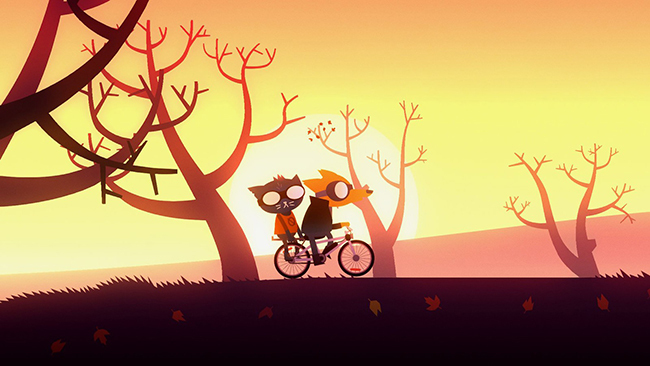 Night in the Woods was primarily created by three people: Alec Holowka, Scott Benson, and Bethany Hockenberry. In 2013, it launched as a Kickstarter project and reached its goal of $50,000 in just 26 hours. In total, the game received $200,000 in funding and was released on PC, PS4, and Xbox in 2017 and for the Nintendo Switch in 2018. It was when it came to the Switch that I decided to jump on the bandwagon and play this game. I’m so glad I did. I don’t want to give away anything about this game but here’s a short description. You play Mae, a college-dropout who has just returned home for the first time in a few years and discovers that in many ways, it’s just as she left it. But in other ways… well let’s just say the game takes a pretty surprising turn that leaves you wondering, “Just exactly what kind of game am I playing again?” Paste describes the themes covered as “mental illness, depression, the stagnancy of the middle and lower classes, and the slow death of small town America.” And that’s just a small part of what makes this game so real (despite the fact you’re playing anthropomorphic animals). For a short (I finished it in three days) side-scroller, this game really packs a punch emotionally. If you follow me on twitter, you probably saw the distressed tweets I made after I finished this game. I was not at all prepared for how much this game impacted me. As someone who deals a lot with many of the same issues Mae has, I found myself uncomfortably familiar with the feelings she struggles with coming to terms with. At times it was like looking into the mirror of a younger me and I can’t say I liked it. But at the same time, the ending brought me comfort and the very real sense that I’m not the only one out there. And I’m incredibly grateful for my friends. 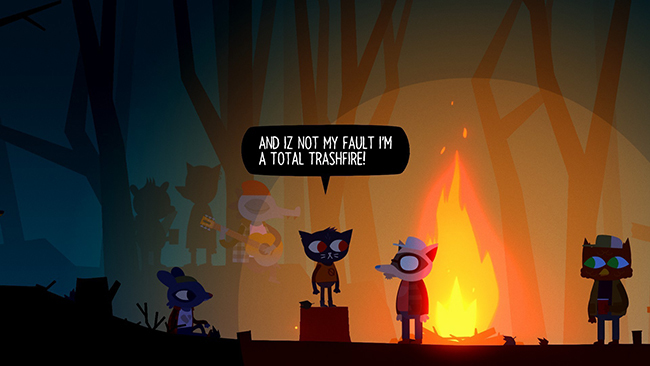 I know it’s only March, but so far Night in the Woods is my favorite game of 2018 and I’m really glad that I was able to knock it off of my To-Play games that I listed in my Fave Games of 2017 post. My initial prediction was correct: this game IS heartbreaking. If you haven’t played it yet, I highly highly recommend you add it to your list. Oh and if you enjoy the game, make sure you play the two mini-games located in the Extras section of the main menu. They add a little more to the main story and they’re just fun to play. Last year I did a review of my favorites games of 2016, so I figured that would be another good way to kick off 2018: by looking back at my favorite games that came out in 2017. In my previous post, I wrote about how my health had started going down hill and I was using gaming as a means of escapism from the stress of my life. Unfortunately that hasn’t changed and my health has continued its downward spiral. I’m now in a wheelchair most of the time and have started having seizures at least once a month, which, tragically, are sometimes brought on by the beloved games I play. Thankfully, I’ve gotten familiar with the pre-seizure aura and sometimes I’m able to stop it from happening. And I can feel when I’ve sat upright and played too much. Gaming isn’t as easy as it used to be, but it’s still the number one thing I use to escape from reality. 2017 was a year of amazing games. I honestly had a hard time narrowing this list down because so many good ones came out but I think I have my favorites in order as well as the ones I wish I had had time to play. So without further ado, here are my favorite games of 2017. What is it: THE BEST GAME OF THE YEAR! Horizon Zero Dawn is a brand new game from Guerrilla Games, the folks behind the Killzone games. It’s a game that completely steps out of the box for them, and man did they do an EPIC job on this one. HZD is a single player, third person action-adventure game with a few RPG elements rolled in. Some folks market it as an RPG game but it’s really not the best description since there aren’t a lot of choices you can make that impact story elements, but the story that’s already there is an incredibly deep and complex one that seeps into every aspect of the game. It takes place in a post-post apocalyptic United States and you play Aloy, an outcast of her village, who must leave the home she’s always known to save the world and find out who she really is – literally. No one knows who she is and slowly throughout the game, you start putting the puzzle together. The world is huge and filled with machine-monsters that look like robot dinosaurs and the ruins of places that you might recognize from the real world. What is it: Mass Effect Andromeda is the latest game in the Mass Effect series by Bioware. It takes place roughly 630 years after Mass Effect 3 and strays away from the characters that we had grown and loved from the original trilogy. You’re no longer playing Commander Shepard, instead you play Sara or Scott Ryder, who eventually becomes the Human Pathfinder for the space station Nexus. The other big difference is that we’ve left our own galaxy behind in search of a new place to call home: the Andromeda Galaxy. And leaving our galaxy means meeting all new alien species, some nice and others not so nice, and finding new flora and fauna to study and planets to settle. This is a true RPG like the original series – all your actions and choices impact the story going forward. And once again, many of your companions are romanceable (and important objective for any Bioware game). Why I love it: I’ll be real with you, when this game first came out it was filled with bugs and glitches and because of that, did not review well with a lot of Mass Effect fans. Despite this, I actually found the game very enjoyable – I love the new companions (especially Vetra and Jaal) and I really adored Sara Ryder (and her VA Fryda Wolff). The story was good to – the idea of going to another galaxy and trying to settle there has all sorts of implications, good and bad, for the original species that make their home there. It brings about a lot of complex questions while staying true to the sort of game Mass Effect is – you answer those questions yourself. Once the last patch for the game went through, Bioware had fixed most of the issues with the first release and I’ve had even more fun playing it a second time. It’s not as emotional as the original trilogy, but I’m also coming from a place where the first games are very much ingrained in who I am so it had some pretty high standards to live up to. It can’t really compete with nostalgia of the original trilogy or with the complete world that Dragon Age Inquisition had created. But it’s still a good game and one I will keep going back to play. What is it: Assassin’s Creed Origins is the latest edition to the AC series by Ubisoft. It’s a third person action-adventure game that takes place before all the other AC games – hence the name Origins. You go back in time to learn how the Brotherhood of Assassins came to be and why they are in conflict with the Templar Order. It’s a very immersive game right from the beginning and you find yourself playing a Medjay named Bayek, and his wife Aya as they navigate the Egyptian world of 49 BC. The history of that time is real but the story told is fictional, making for a very interesting and in depth narrative. The gameplay is different from past AC games – it’s more fluid and realistic, and, in my opinion, easier to fight with. Like all AC games, it does have the necessary two worlds – the past and the present. In the present, you’ll find Layla Hassan, a researcher who discovers ancient Egyptian tombs and decides to relive the memories of the past. Why I love it: I’ll start this by saying I haven’t finished this game yet! But oh my gosh, do I love it. I’ve only ever played one AC game before (Black Flag) so this was a game that was only on my “Want to Play” list because of what I had seen during E3. My husband bought it and I was instantly floored with how different the style felt from previous AC games. I immediately started playing on my own and fell in love with the Bayek, the setting, and the heartbreaking story of these characters. Every interaction you have in this game is very dynamic, from guards to benign NPCs to the animals (OMG THE CATS). Oh and having your eagle companion Senu for “eagle vision” is such a small but significant change from the other games – it makes all the difference to the narrative and to the realistic portrayal of Bayek. It’s so good. Many of the reasons I love ACO are the same reasons why I love Horizon Zero Dawn – the research that went into crafting a fiction narrative in a real world setting is so incredibly impressive. I’m blown away by this game. What is it: I had to include a mobile game in this list since I’m on my phone a lot. Pocket Camp is the new mobile Nintendo game for Animal Crossing. 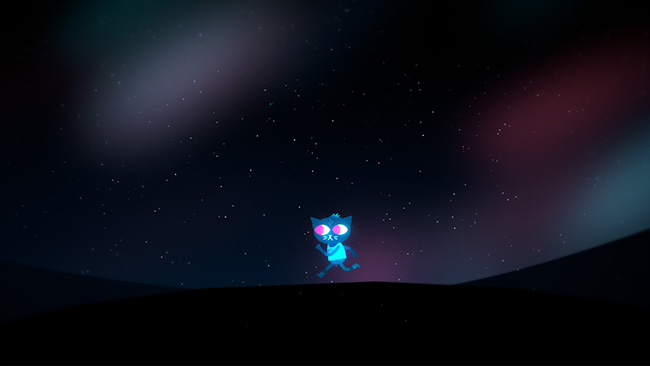 It’s cute, adorable, and very easy to play (and it’s addictive). I’ve never played Animal Crossing games but I got sucked into this one because all of my friends were playing. Basically you create your human character (the only human in this world apparently) and set up a community campsite where you can decorate and build lots of things. You then invite the different animal campers you meet into your campsite by raising their friendship levels through bribery (I mean, really, that’s what it is). You give animals things they want, they give you awards, their friendship goes up, and eventually they agree to visit your campsite (as long as their demands for specific “glamping” items are met). Honestly the whole premise is kind of weird, but it works. Somehow. Why I love it: There are days that I’m not able to play console games or even watch TV because I get sick or my epilepsy is triggered. It’s on these days that I’m on my phone the most (it’s literally the only way I socialize most days) and having a fun and cute mobile game to play keeps my game cravings to a minimum. When I say it’s addictive I’m not kidding. When I first started playing it, I was checking it every two hours because that’s when the campers rotate. I’m not as addicted now but I still play it once a day because Nintendo is constantly adding new characters, items, and events. It makes me actually want to play Animal Crossing on a console for the first time – I never realized what this game was about but it seems pretty cool. And it helps that it’s adorable. I even love the sound effects in the game and I usually always have the sound off on my phone. But the way the characters talk reminds me a lot of Banjo-Kazooie noises and I love it. What is it: Star Wars Battlefront II is the sequel to Star Wars Battlefront (duh) and it’s even better than the original in almost every way. It has both a short campaign solo story and also it’s more popular multi-player game mode. The single-player story mode has you play Iden Versio, the leader of an Imperial Special Task Force called Inferno Squad. You play the game through her eyes and watch as her perception of the war changes – first with the Rebels and then the Empire. It’s a really strong narrative, and even better if you read the prequel novel Inferno Squad by Christie Golden. The gameplay itself is very straight-forward and very linear – it’s a stark contrast from the open-world concept that is so prevalent in video games now. The multi-player mode consists of eleven planets and features battles from all three eras of the Star Wars movies. It’s a much bigger and robust game than the original Battlefront. 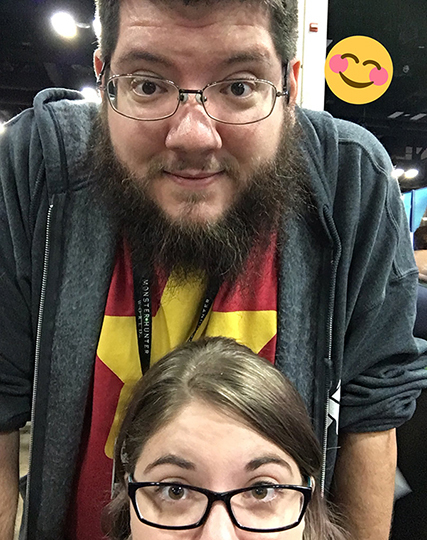 Why I love it: When the first Battlefront came out, my husband and I got to try it out at SDCC and loved it – we’ve played together in Battlefront II and the maps are even better. I first got excited about Battlefront II when Janina Gavankar introduced Iden Versio at E3 last year. A female Imperial Officer as the main character of a full campaign? YES PLEASE. I was hooked. Unfortunately I couldn’t play the entire campaign myself. I got as far as the first dogfight battle in space and ended up having a seizure (this sometimes happens with FPS views). So instead, I watched (and listened) to my husband play the rest of it for me and made me so happy that the Inferno Squad story continued in the way it did after the book. The book left me wanting more, and the video game gave me the conclusion I wanted. I’m a big fan of books supplementing content for movies and games although I know others feel differently. Outside the story mode, the maps of the multi-player games are fantastic – the graphics are unbelievably detailed and beautiful. My favorite is the fight against the droids on Naboo. What a gorgeous setting. This game got off to a rocky start with fans, but I really love where it’s ended up. There’s never enough time in the year to play all the games I want to play. Here’s a few of the games I missed out on (even though some of them I actually own already). Legend of Zelda: Breath of the Wild: I mostly haven’t played this game because Jake has hogged the Switch since we got it and has been playing this game constantly. From what I’ve seen, it looks amazing and I can’t wait to get a turn to try it out. Super Mario Odyssey: Another game I actually own already but I just haven’t had a chance to play yet. It looks really good and I’ve been excited for it since E3. Jake has played a little and from what I’ve seen, it holds up to the hype. 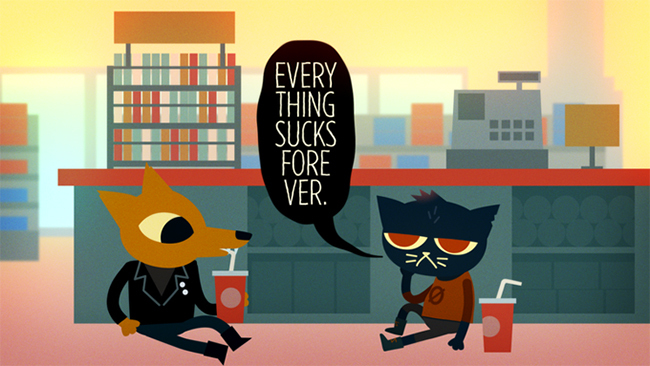 Night in the Woods: Oh my gosh I want to play this game so much. I just found out it’s coming to the Switch so I’m looking forward to buying another game for our latest family console. The whole story looks so good and possibly heartbreaking. Pyre: I love everything that comes out of Supergiant Games. Transistor is one of my favorite games and I loved Bastion so when I heard they were coming out with another game, I was stoked. I only just recently bought it and I can’t wait to dive in. Hellblade: Senua’s Sacrifice: This game has gotten such strong reviews and I’ve almost bought it a few times. I recently had a friend play through it and tell me I HAD to play it so it’s on my list for this next year. Welp, that’s it. That’s my 2017 Gaming Year in Review. I highly recommend all the games I’ve mentioned here, even the ones I haven’t been able to play yet because I have full faith in all of them. Especially Horizon Zero Dawn. I’m looking forward to seeing what 2018 has in store for us. Monster Hunter World, anyone? (The beta was pretty fun.) Bioware’s Anthem is also supposed to be out in 2018 and it’ll be interesting to see what they’ve come up with. But the game that’s got my eye right now and I’m hoping beyond hope that it ACTUALLY comes out? Kingdom Hearts III. Perhaps 2018 is the year they finally give us this game. They say it’s coming, but do I dare believe them? We’ll see. 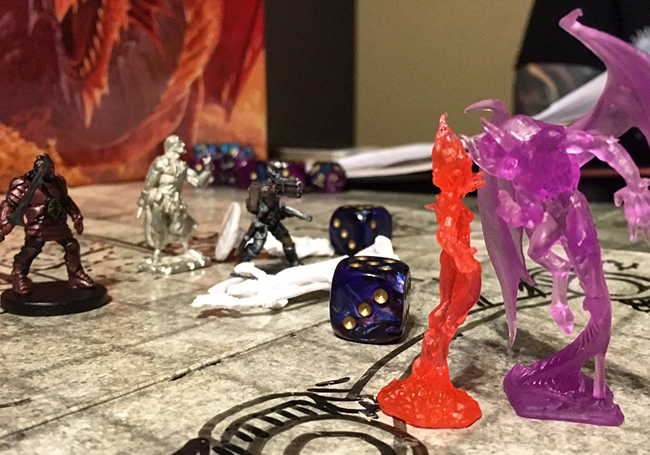 It’s 2 in the morning so I’m going to ramble for a little bit about this fun little game called Dungeons & Dragons and why it matters so dearly to me. You might have already heard this from me before (especially if you follow me on twitter) but bear with me. 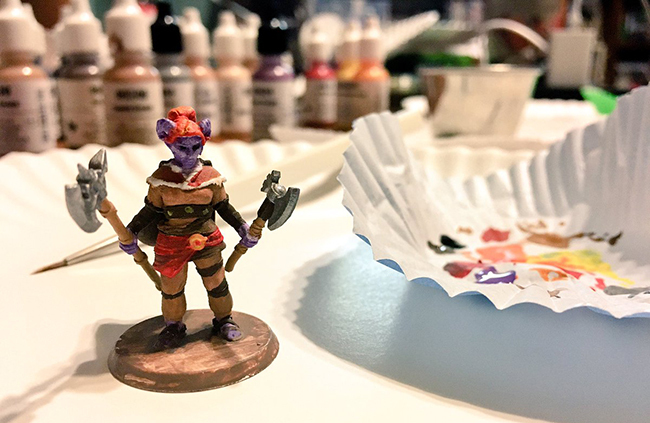 I’ve been playing DnD for a over decade now, though I’ve been familiar with it since I was kid growing up outside Lake Geneva, WI (it’s hard to avoid when that’s where the whole thing originated from). I had cousins who loved it but most of them were older boys who didn’t really care for a whiny girl to join (I can’t really argue against that – I was a pretty whiny brat). When I was in college, I had a pretty rough time. Depression, anxiety, suicide attempts, rehab, the works – I was a mess. I was 20 years old when I was invited to join my first game (I’m 31 now for those counting). I didn’t care so much for the other players, nor did I really understand the rules, but I definitely understood the element of escapism. It was exactly what I needed at the time in my life. I loved being someone else. Someone stronger. Faster. Taller. Magical. Someone with much higher charisma than the awkward and insecure woman-child I felt like in real life. 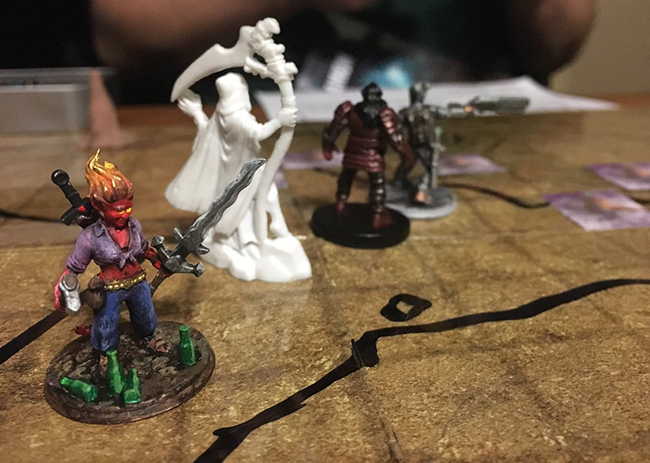 My relationship with DnD has changed a lot, but that feeling hasn’t. It’s still true. After playing this game for so long I’ve come to understand the technical aspects of it pretty well, but it’s the emotional elements of the game – the journey of the storytelling – that keep me at the table. The emotions from me, my characters, my friends – it brings us closer together. More real. The people I play DnD with have become the people I trust the most in my life. There’s something about RPGs that enable people to leave their walls behind and open up to each other. I find myself to be the most real version of me when I’m playing my fictional character. January will mark 2 years since I became sick and have had to watch my own body begin to deteriorate around me. I lost my job, I lost some friends, I’ve lost most of my ability to walk. My day to day life has drastically changed from what it used to be. It has been the most trying time of my life. But every week I play this silly game with those I love and it keeps me going. I get to be someone who can run and jump and save people and hunt and protect and I get to be myself – silly and hopeful and relaxed – with my traveling companions in a made-up world all our own. This game has helped motivate me. Has kept me from giving up on my worst days. I never expected 10 years ago to be so indebted to a tabletop game. But Dungeons & Dragons has saved my life on more than one account and I will forever be grateful. I play in 2-3 campaigns a week now and between doctor appointments and hospital visits, it’s what keeps me sane. Escapism isn’t always the healthiest coping mechanism but let me tell you, my therapist very much approves of it because it gets me to socialize, have fun, and reminds me of my own inner strength. She’s so into it that she’s even started doing her own research about the game and how it helps in psychology, especially with kids. One of the first things she always asks me in our sessions is “So how did DnD go this week?” She knows that’s the best way to get me to start talking. It’s a whole other world to her but she recognizes the mental care it gives me and encourages it. Sometimes, like now, I just get really really emotional over DnD especially seeing how incredibly popular it’s gotten in the last few years. It’s wonderful. I’m thankful Jake got me back into Critical Role too because I’ve met so many new friends through it. This community has grown so much in the past decade it’s overwhelming but in a good sense. 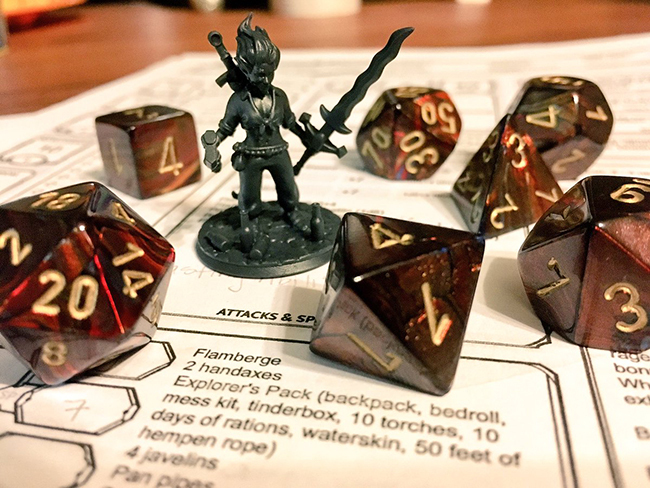 Almost all of my friends have at least heard of or seen a DnD campaign in progress or tried their hand at an RPG game, and it blows me away how inclusive and welcoming the world has become since I first began my DnD journey. All of this is really just to say, thank you to all my friends and to the good folks at Wizards of the Coast for working so hard to make this little tabletop game the best thing in my life. I wouldn’t be the same person without it. Hell, I might not even be here at all. So thank you. Happy teN7 Day, Mass Effect Fans! Happy N7 Day, friends! Or should I say, teN7 Day? Okay so I’m a few days late, but considering Bioware is making this a week-long celebration in honor of their Ten Year Anniversary, I’m still technically on time. I don’t have much to say that I haven’t already said about these games. Did you know my wedding theme last year was Mass Effect? Or that these games got me through a really tough time? Or that my husband made me a custom Fem!Shep Funko? Yeah Mass Effect is such a big part of my life, I have it tattooed on my body. This month marks 3 years since I finished the original trilogy for the first time (and 3 years since I got that tattoo). I definitely would not be the same person or be in the same place in life it wasn’t for Mass Effect. It literally changed my life. For good and for better. I’ve started a second playthrough of Andromeda but I’m filled with nostalgia. I think it’s time to return to where it all began. Shepard will always be my Commander. If you have asked me in the past why I love Mass Effect so much, why this video game has changed my life, why I have the N7 insignia tattooed on my arm, I want you to watch this. Even if you don’t know anything about Mass Effect. This video conveys so much in a short amount of time why these games are so beloved and important to so many of us. Why we follow Commander Shepard, as human and flawed as she is, to the ends of the Universe and beyond. The moment I heard that opening screen music from the first game, tears came to my eyes. It really is like coming back home again.